Our ultimate goal is to help colleges and universities become better places to work and learn. Pioneering a new frontier, ModernThink partnered with the Chronicle of Higher Education in 2008 to co-found the Great Colleges to Work For© program in 2008. Great Colleges provides senior-level administrators and academic leaders with insights into the quality of the workplace experience on their campuses and the competitiveness of their policies and benefits. The program has quickly become one of the largest and most prestigious recognition programs in the country. You can learn more at Great Colleges website. Having worked with over 1,000 colleges and universities across the country, we have accumulated an unparalleled database of workplace quality metrics and best practices. We use this rich database in our private consulting practice to help our higher education clients understand how they stack up relative to the best of the best. We work with schools ranging from small liberal arts colleges to large research universities as well as both 4-year and 2-year colleges. We have also partnered with state systems including the University of Tennessee System, the West Virginia state system and the Dallas County Community Colleges District. Our partnership philosophy has us continually focused on what’s best for our clients. Our consultants are experts in higher education. They are steeped in the nuances of academe. Several are considered thought leaders on topics ranging from enhancing workplace quality to transforming your culture to conducting climate surveys to data-based strategic planning. We have accumulated an unparalleled database of higher education benchmarking statistics and best practices. This resource provides you with objective, credible feedback about how your college or university compares to peers. We use a wide variety of assessment tools to help colleges and universities protect their greatest assets and their largest investment – their people. These assessment tools provide insight and information to university leaders that help them understand how the campus climate and culture are either enhancing or undermining not only the faculty and staff experience but also student outcomes. Our proprietary technology affords us maximum flexibility when designing surveys and reports. It also allows us to move extremely quickly and to be highly competitive in pricing. We are committed to understanding your institution’s unique needs and then customizing a suite of services that meet those needs. One size never fits all at ModernThink. We’re not interested in selling you surveys and services that we happen to have. We are dedicated to creating custom solutions to meet your needs. 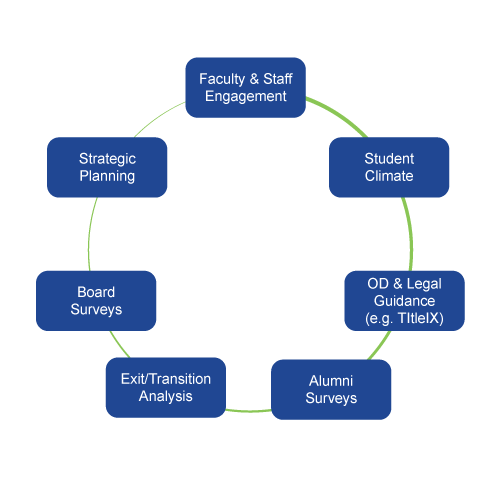 At their core, our services (highlighted in the graphic below) are designed to gather, summarize and synthesize feedback from a wide variety of campus stakeholders and then to help leaders understand key themes, trends and patterns so that they can make data-driven decisions. Their analysis is enhanced by tapping into ModernThink’s unrivaled database of workplace metrics and best practices so that they can see how they compare to peers as well as how others are dealing with many of the same challenges that they face. By way of example, we will work with your institution to design a suite of custom surveys for your faculty and staff, students, Board and/or alumni. We will start with a comprehensive assessment of your unique needs and goals, and then use our expertise to design a solution tailored to your objectives. Using this integrated approach vastly improves communication flow and ultimately knowledge given that pieces of the puzzle are not scattered across multiple siloes. Only when the information is aggregated and the reporting is uniform and consistent across functional areas can leaders truly see the big picture come together, ultimately allowing them to make better decisions and mitigate risk. Clients consistently tell us how pleased they are not only with ModernThink’s stellar project management skills but particularly with the insight they are able to gain by gathering integrated feedback and working with ModernThink’s OD consultants to advance their institution’s strategic planning. ModernThink’s project plan was outstanding from meeting with senior leadership on the campuses and institutes all the way to town hall meetings for employees of the university. Facilitation skills were outstanding. ModernThink is absolutely the best project planner with whom I have worked. They kept us on track from the beginning, and we always knew what we had accomplished and where we were headed. We finished on time with greater results than expected.